Constantly fighting with my skin. Hello and good evening to everybody outside and still awake! Recently I've been fighting with my skin. It was never in the best condition; I always tend to have break-outs (mostly chin) and pores which are visable. I never "cared" that much about my skin because every skincare I bought made my condition worse ;__; So after a few tries I just removed all my make-up in the evening and sometimes used a cream to hydrate my skin. Good thing about is that my skin isn't dried or oily. Its just not clean, and that bothers me a lot. Since I came to Japan I was very curious because they have so great products here! First thing I bought was a cleansing oil for the evening. 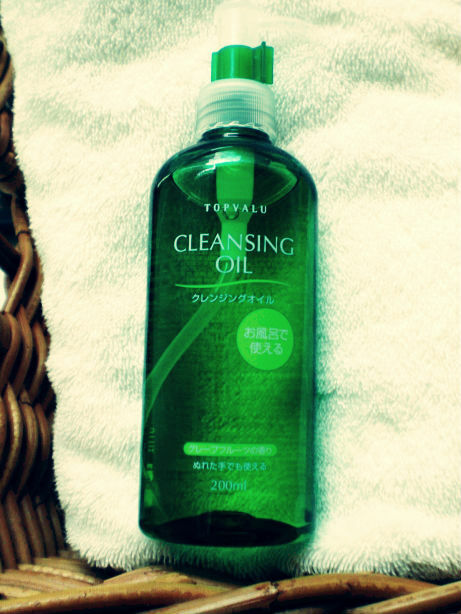 Because I don't know about the brands here that much I chose a pretty cheap option and went for Topvalu Cleansing Oil. Did not make the picture... tried the last days but forgot everytime. It comes in two fragrances, I chose grapefruit! The scent really is great, I like it a lot. I use this for maybe 3 weeks now and I really like how it feels on my skin. It feels relaxed and not irritated. In the beginning I used this cleansing oil in the morning and evening, but my skin was not pleased and punished me with even more break outs. So I reduced the using to once a day in the evening when removing make-up and my skin condition grew better. But I can't really see a difference... have breakouts here and there some time. Maybe it's slightly better but not that much visable. But I like the cleansing oil, because it cleanse and removes make-up at the same time, which is very comfy! Maybe won't buy it again, though. My roommate and I were also thinking about upcoming HELLOWEEN! We have lots of dates and really busy during the weekend which is a good thing having fun with friends we recently made (: (I'm very thankful we adopted so fast to Japanese way of lifestyle..). So for Halloween (and because I was thinking about it beforehand a lot) I buyed new circle lenses. I wanted the special Halloween ones from Pinky Paradise.. but because there is no express option for Japan they wouldn't attend in time. They would've been gorgeous for a vampire.. 'sad face' And in the reviews they keep saying that these really hold what they promise when it comes to color! Really sad I didn't see them a week before or so. So I browsed at Rakuten because I wanted new lenses for Halloween and well, what should I say? I bought the Apple Green ones. (You know, the famous overhyped Tsubasa lenses..) I don't know if this was a good idea but I wanted to try them for so long! And... if they look creepy I wouldn't mind because they are supposed to be worn at Halloween :D Think they'll arrive tomorrow or Wednesday at least. So if you have any good experiences with BB Cream I would love to hear your experiences! And I swear... the next post will be more interesting. Typing that between homework and deep craving for sleep. Good night or a nice day, depending on where you all live.! I've tried almost every bb cream under the sky. lol Okay not that true but I've tried A LOT. What is your skin type? My personal favourite is Scnic's (I've reviewed it on my blog) and Elishacoy BUT these are more of the "pricy-er" brands and you can get good quality cheaper. I personally am not a fan of the skin79 brand, I feel like it's pretty heavy, my "favourite" would be their gold bb cream. Etude House's mineral bb cream is also really good, light and cheap (so a good first try)! There are travel sizes you can buy of elishacoy for like $10 (I suggest the ebay seller Bellogirl, she sells legit products. Has sent invoices and such from HQ proving so).